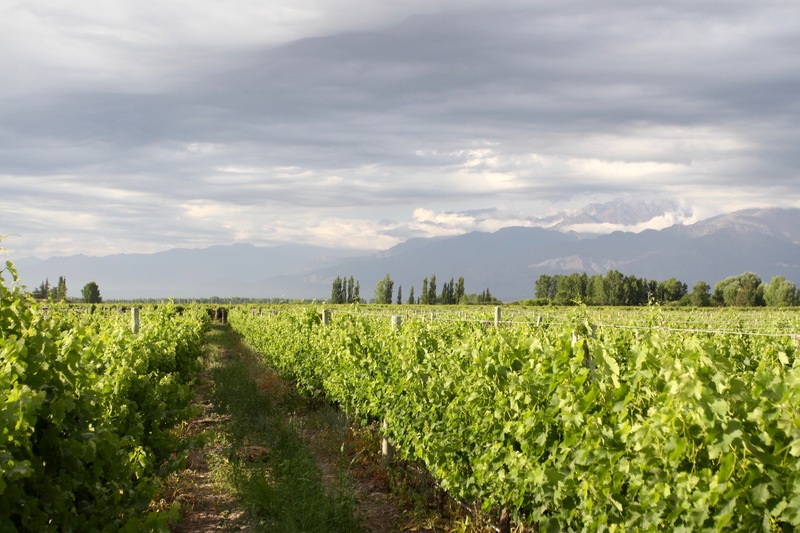 Nestled in the foothills of the Andes, the vineyards of the Valle de Uco stretch across a vast landscape under an immense sky. 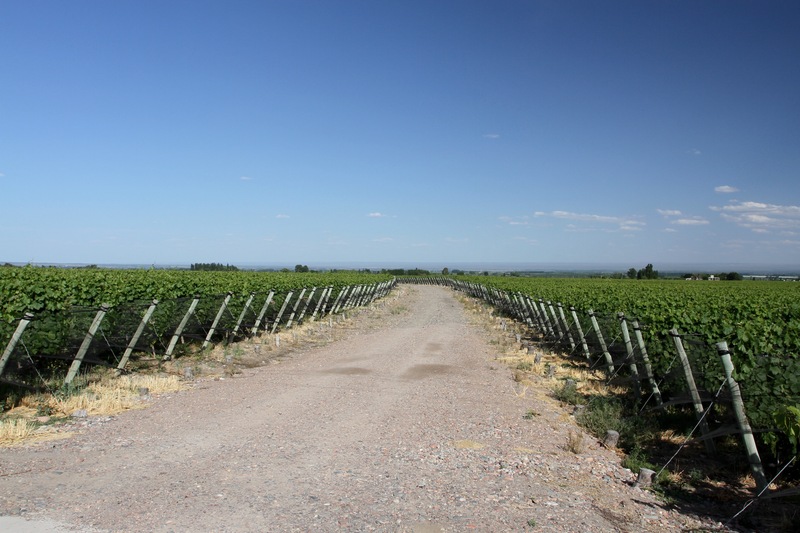 This is one of the premier wine growing regions in Argentina, producing some of the country’s most famous and delicious wines; and it’s dotted with fantastic bodegas that offer high quality accommodation, great food and, of course, plenty of wine tasting opportunities. 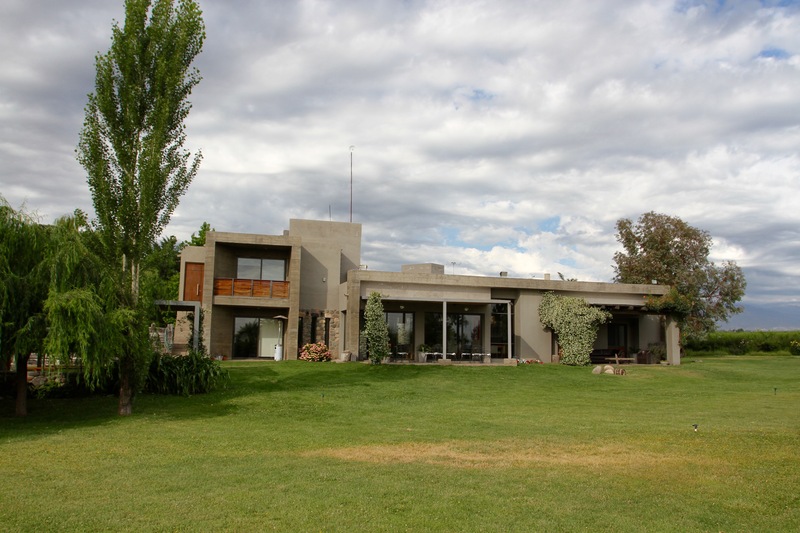 If you have the time, and the cash, it makes for a truly luxurious few days in lovely countryside only a 100km south of Mendoza. 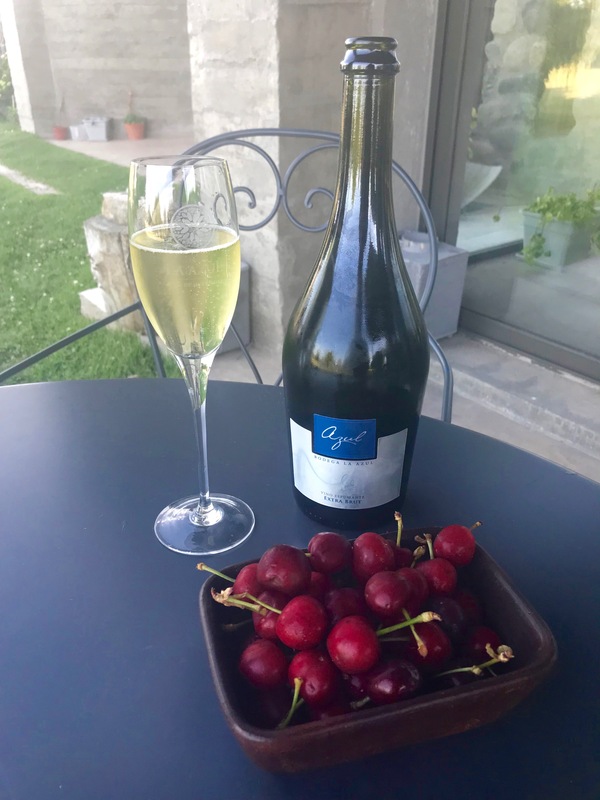 We had three nights booked at the Casa de Huespedes Finca La Azul, which sits in the middle of vineyards interspersed with peach and plum trees. It’s one of the friendliest and most relaxing places we’ve ever stayed. It set the tone for a lazy few days in the valley, hopping from bodega to bodega tasting extraordinary wines, and having some of the most delicious food of our trip, all locally sourced. 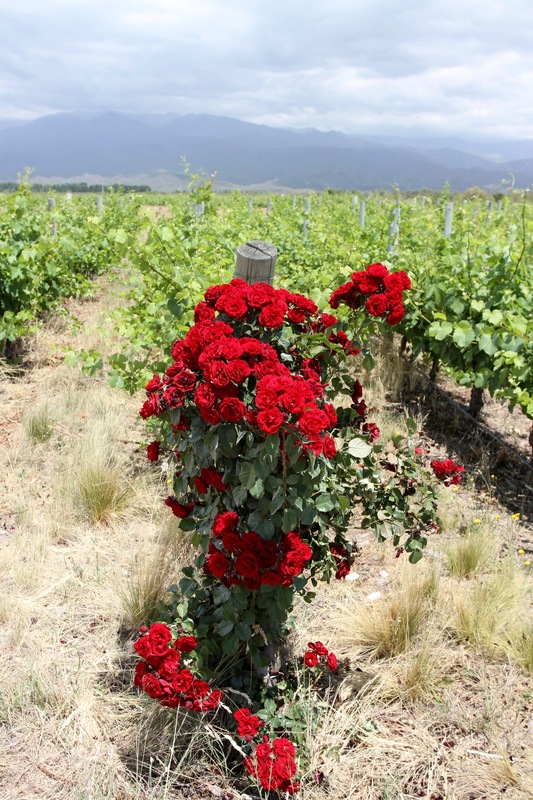 Best of all, we spent time sitting in the garden at La Azul trying their range of excellent wines produced a few hundred meters away. We didn’t want to leave. We arrived at the finca late in the evening. Turning off one of the long straight roads in the Valle de Uco, we crunched down a gravel track in the darkness of a country night just able to see the rows of vineyards on either side. Once inside we were offered a late dinner and had a bottle of something red and tasty while we chatted to the chef and the owner. It’s always disorienting arriving somewhere in the dark, and I was keen to see our surroundings in daylight. The next morning I went for a walk through the vineyards as the sun broke through the clouds, illuminating the mountains in the background. It was beautiful. 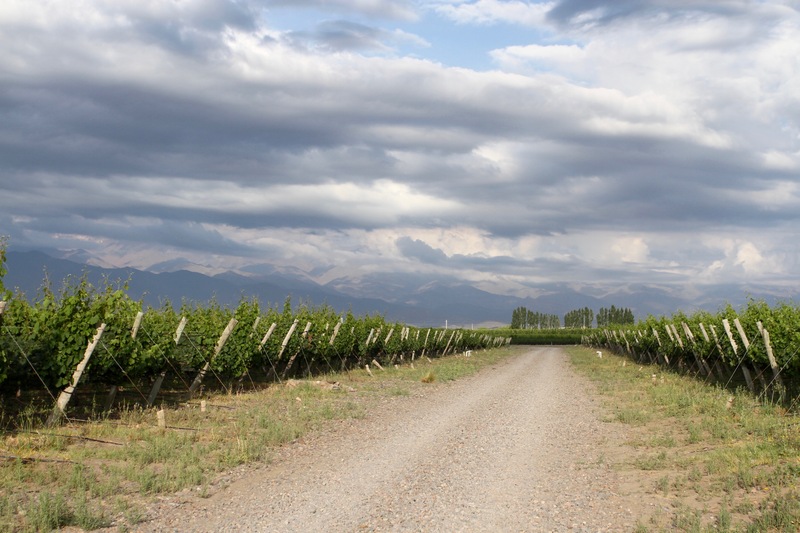 As in Mendoza, the weather was a bit hit-and-miss, with rain and shine. 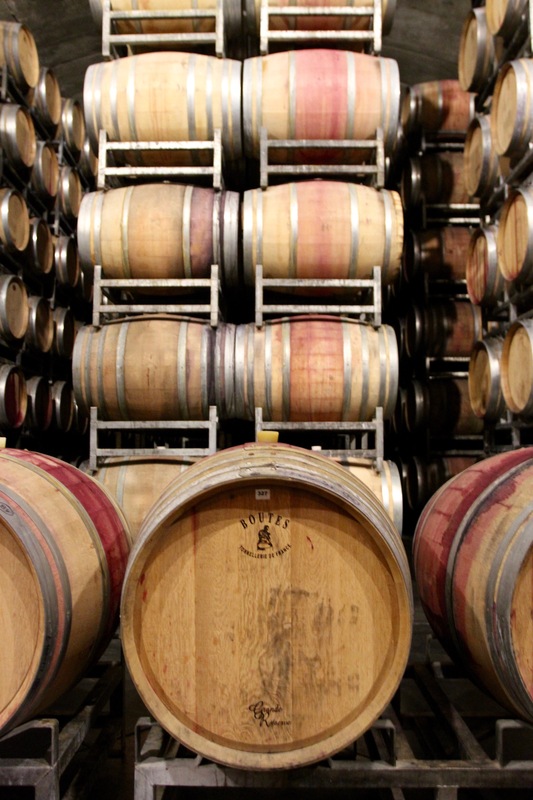 Luckily, when the weather is bad in the Valle de Uco, wine tasting is an indoor activity. 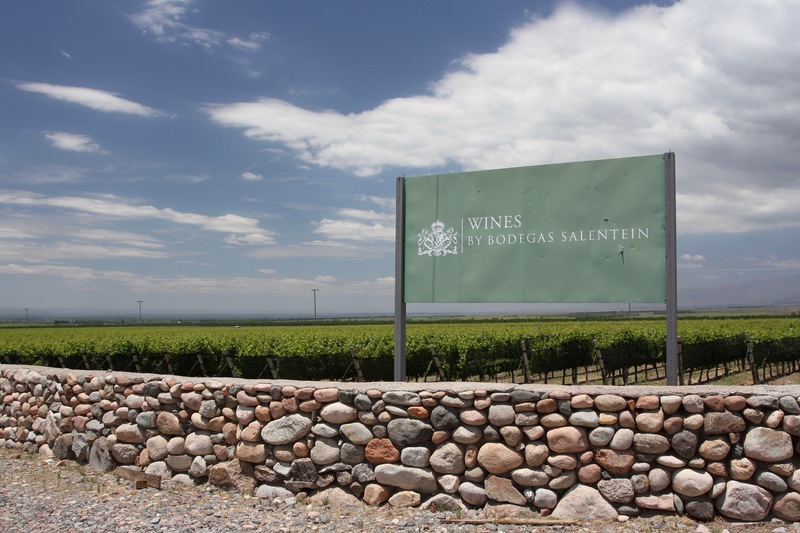 A couple of kilometres down the road is one of the more unusual wine producers at the Bodega Salentein. This is a famous Uco producer, but the twist is that it’s owned by an aristocratic Dutch family. It’s the descendants of Heribert Van Westervelt, a prominent 18th century aristocrat from the Dutch province of Gelderland, who founded the Bodega Salentein, and who are credited as pioneers of the recent transformation of the Uco Valley into one of the world’s wine hotspots. 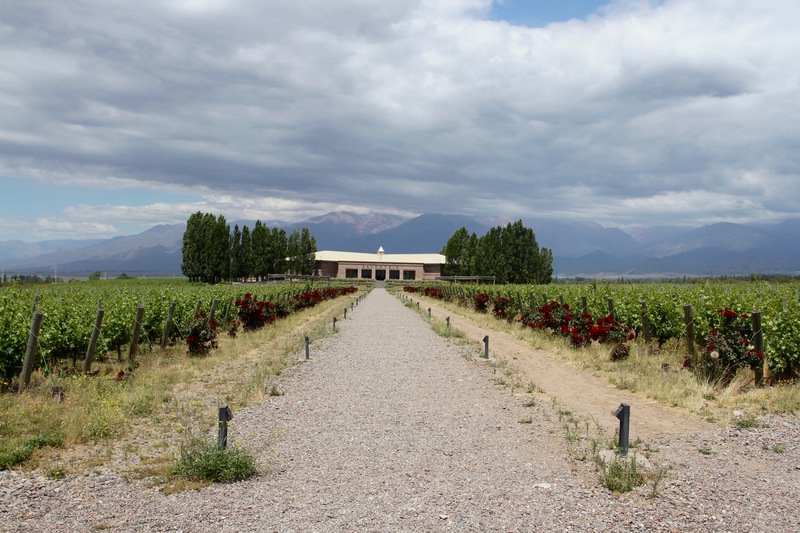 The state of the art facility we toured produces some excellent wines – they were served at the wedding of the current Dutch King and Queen – and sits amidst vineyards overshadowed by the Andes. 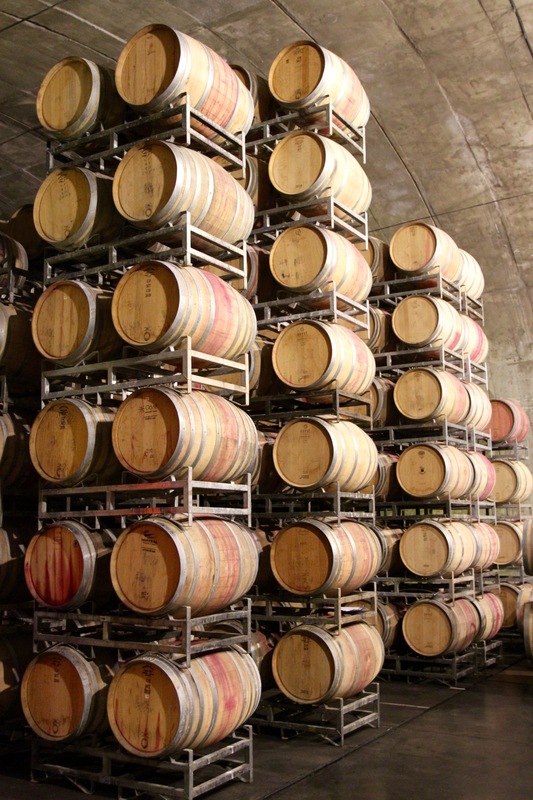 The huge circular underground cellar is a bit like a Roman temple, creating a sense of religious reverence for the barrels of wine stacked all around. 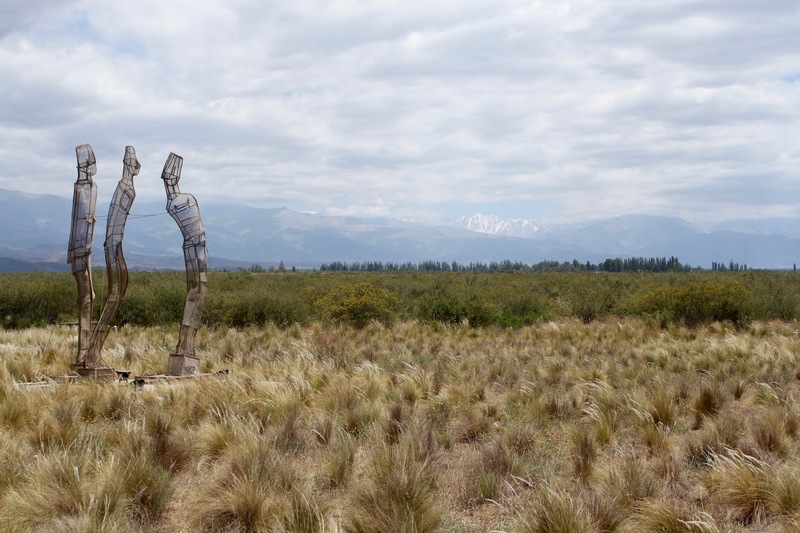 There’s a nice art gallery on site, as well as art in the grounds of the bodega, but compared to other places we visited its modernity felt a little soulless. Afterwards we strolled back to the car under a now ferocious sun, and headed for a six course tasting menu paired with tremendous wines at the Bodegas Andeluna Vineyard. The Valle de Uco is a pretty upmarket place, and fine dining options abound, but food at the Andeluna was exceptional. By the time we emerged from the Andeluna, and it was a long lunch, it was raining hard. 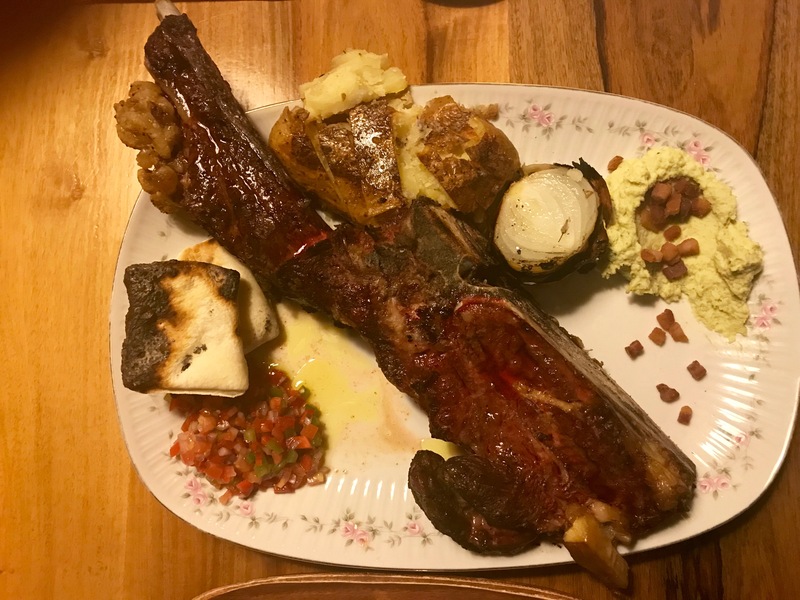 Luckily, we were staying only a short distance away and we staggered back to relax and digest our lunch in time to have another excellent dinner at the La Azul, which included an extraordinary piece of meat from the barbecue … I could get used to this kind of luxury travel.